Phoebe Shin completed the fall golf season by winning the DODEA Europeans golf tournament last week at Wiesbaden’s Rheinblick course. Shin’s top performance with 90 Points was followed by other Ramsteiners in second and third places to give the Lady Royals the team title, as well. Shin, Lauren Sutherland, and Harley Parks made up a strong Lady Royals contingent and Shin, a senior who hopes to pursue a medical career, was the leader after the first day of the tourney. 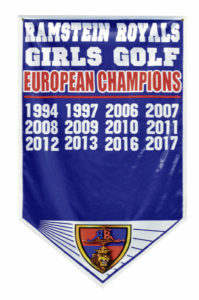 It was the 10th time in the past 12 seasons that Ramstein has won the girls’ links Europeans. Shin said having played the course in previous seasons gave her an edge when it came time for 2018 Euros but she benefitted even more from playing against a solid teammate like Sutherland. 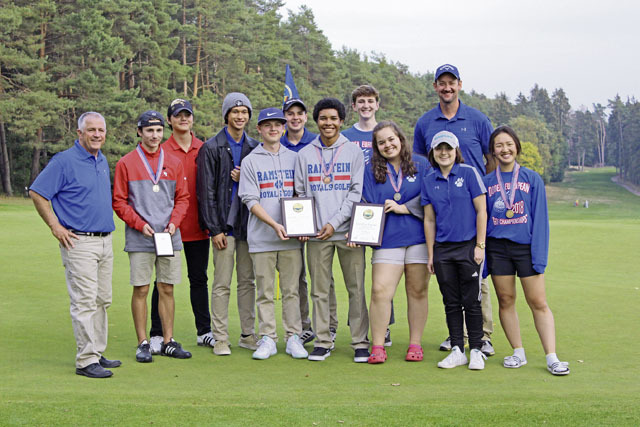 Ben Todman was the top Ramstein male golfer, taking third place overall behind winner Bryan Cortese of Wiesbaden and runner-up George Stephan of Kaiserslautern. Cortese totaled 90 points with the Stableford scoring system used at Euros while Stephan had 63 and Todman had 60. Just like the girls, Ramstein’s boys’ program is a mighty force on the DODEA circuit. 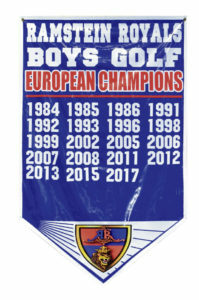 This year’s title marks the 10th Royals boys’ title in the past 14 seasons.